Our Kalispell Dental Professionals | Leslie B. Anthony, D.M.D. Dr. Anthony was born and raised in Augusta, Georgia. She completed her undergraduate education at Emory University in 1982 and graduated from the Medical College of Georgia School of Dentistry in 1989. Dr. Anthony completed a residency program in general dentistry at Oregon Health Sciences University in conjunction with the Veterans Administration Hospital. Dr. Anthony and her two adult children love their Montana home and the many activities available in the Flathead Valley. Dr. Anthony is a perfectionist who insists on the comfort and satisfaction of her patients. She is experienced and competent in complex dentistry and has pursued extensive continuing education to provide optimal dental care for her patients. She is a member of the Montana Study Club, where she studies under internationally renowned prosthodontist, Dr. Frank Spear and UCLA CED Director, Dr. Ed McLaren. Dr. Anthony also volunteers for Shepard’s Hand Clinic in Whitefish, Donated Dental Services of Montana, The Body Balance Program, Soroptimist International of Whitefish Smile of Hope, Great Shapes Jamaica, and Women for Women International. Is a registered dental hygienist working on Dr. Anthony’s professional team since July 2012. Lindsey attended FVCC and completed her degree in dental hygiene in 2011 through MSU Great Falls. Lindsey spends most of her free time chasing her son and watching him grow big and strong. Lindsey sometimes appears in our office as the resident tooth fairy. 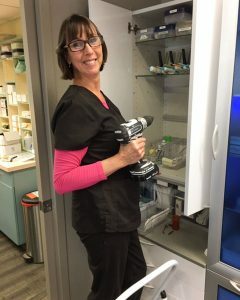 Sandy is a registered dental hygienist who began her Flathead Valley career in 2003, doing vacation and maternity relief for other hygienists at Dr. Anthony’s office. Sandy attended the University of Indiana at South Bend where she concurrently earned her Dental Hygiene Degree and a Bachelor of General Studies Degree. Living overseas for many years afforded Sandy an opportunity to adventure extensively throughout the world. She now spends every spare minute grooming, training and traveling to show her ChowChows. 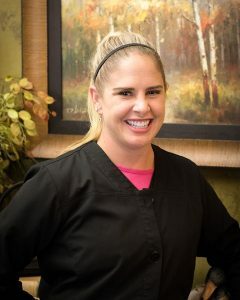 Has been a dental assistant for Dr. Anthony for over 7 years! She was born and raised in Whitefish. In her spare time, she enjoys snowboarding, working out, and playing pool. She also likes spending quality time with her pets. Our team was excited to share Chelsea’s marriage celebration to Sean in October 2018! Has been in the dental field for 35 years!! She has experience in general dentistry and orthodontics. She has lived in Montana for 22 years. Yvonne and her husband enjoy going to church, gardening and NASCAR. Her avocation is cake decorating – another area where she excels! Her depth and breadth of dental experience is invaluable as a dental assistant in our office. Darcie started working in January 2018. She adds an extensive business background and organizational talents to our dental practice. She can be found behind the scenes, keeping things running as smoothly as possible for the dental assistants and hygienists. Outside the office, Darcie is a Big Sister in the BBBS program, is involved in Canvas Church, enjoys arts & crafts that involve power tools, renovating projects, plowing snow and boating on Little Bitterroot Lake. Is our Scheduling Master / Patient Advocate. He has worked for Dr. Anthony since 2002. He is quite busy trying to keep up with two young children. He has a BA in Psychology from University of Richmond. He moved to MT in 1994 after a visit where he became enamored with the beauty of the area and the friendly people. He loves his job working with people. He also likes dogs, kids, Frisbee, long walks on the beach and desires whirled peas. Is the office manager tending to all things administrative for the office. She has been with Dr. Anthony since October 2008. She and her husband raised two daughters in the Flathead Valley and are now enjoying an empty nest, including boating, hiking, Seahawks games, and travel. She is available to help all Dr. Anthony’s patients with payments and insurance billing.